Seriously, it seems 9mobile Nigeria is now making sense. The company has finally introduce another fantastic offer for new subscribers. The painful part about this great offer is that, it only works for new 9mobile customers on morcliq 2.0 line within first 30days on the network. With this new Package, According to 9mobile, you can purchase 1.5gb data for just N200 and of course, you can also purchase 4.5gb data for just N500, but it will only last for 5days. 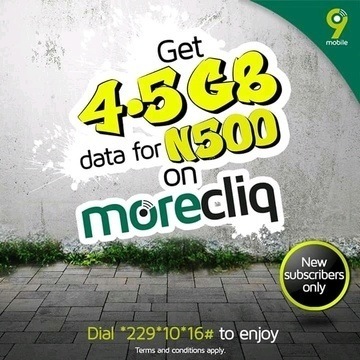 So therefore, If you are on already on 9mobile Morecliq 2.0 this offer supposed to work for you without any issue. If you want to confirm or check your former Tarrif plan package you can quickly dial *244*3#. And of course, if you want to migrate to Morecliq 2.0 quickly dial 👉*244*1# to migrate. After migration successful now you are free to sub for the plan and enjoy.